In the common folk belief, the idea that the subterraneans could lure people into their realm, was well established. For the most part, this practice did not occur at random, yet was percieved as a punishment for committing some sort of norm violation. Whoever in charge to keep watch over the cattle, should not under any circumstances fall asleep, act careless, accompany strangers; if so doing, chances were that underworld creatures would come and lure you off the beaten track. Many stories tells of a young boy or girls’ encounter with the creatures in the mountain. Some emphasize the splendor and riches which was finally within grasp; for those wrestling the struggle and toil of everyday life, the idea of surrender to a magical world of otherworldly creatures might have been alluring. However, this feature is not a predominant part of these legends. It was considered a great victory when someone was freed from the subterranean grasp, returning to conventional labor. If one were lucky that is; for the stories exists also about many a soul, returning from the mountains as halfwits mutes, never being able to recover back to a normal life. 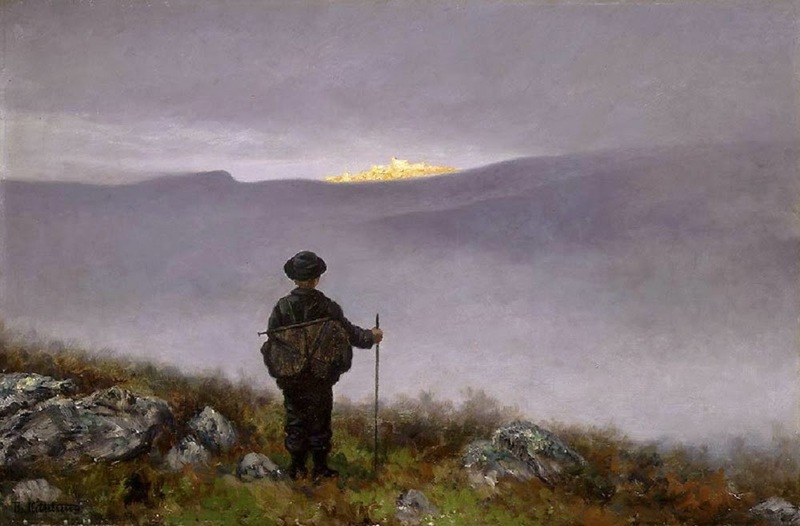 Painting by Swedish artist Axel Törneman (1880-1923). As with the idea that the subterraneans execute kidnappings, by switching human babies with their own changelings, it was also believed that these creatures were able to mate, and consequently have children with human beings. According to the folk belief, it was usually young women who were lured into the mountain, and several songs depict their longing back to the human realm. 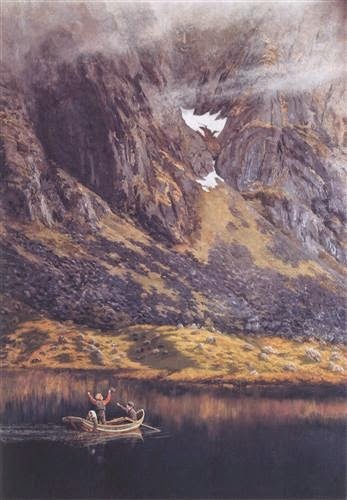 In Norway, the ballad of Liti Kjersti is one of the most well-known within this folk song-tradition – similar ballads are to be found also in Sweden, Denmark, the Faroe Islands, Iceland and Scotland. 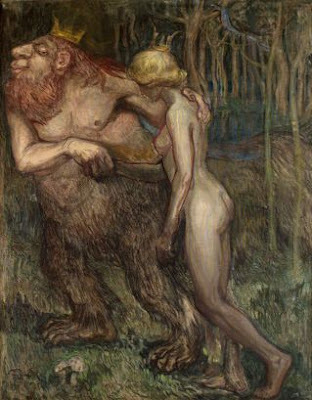 Liti Kjersti has been lured by mountain king into his realm, where she gives birth to his children. After returning to her own home, her mother discovers this because of milk dripping from her daughters’ breasts. Kjersti Plays a harp that the mountain king has given her, and he comes riding to the farm and takes her with him. When they approach the mountain, her little children come running toward her, and Kjersti recieves a forgetfulness potion, so all reminiscent of the world of mankind is lost. This ballad has been interpreted in many different ways throughout the years, and it is perhaps part of the reason why it has been so popular. Different singers and listeners have been able to add different experiences and emotions in it. Some emphasize the tragedy of Liti Kjersti being seduced and abducted by someone who lures her from her familiar and safe environment. However, although being identified as a “mountain king”, he can also be interpreted as a symbol of a man who does not fit within the socially accepted norms of relations – therefore Kjersti is evicted from home, when deciding she wants to be with him nonetheless. The text has also been subjected to a psychoanalytic interpretation that goes in the direction of strong maternal bond, and Kjersti inability to secede and choose for herself. The mountain king in this sense emerges as both her liberator as well as her destruction. Kjersti must make a clean break with her mother to able to see to her children again, and to return to where she has come to belong. - The brown foal trips so lightly. She could not govern her own life. deep beneath the rocks the underworld is luring you. I have prepared ale and vine. And there I am betrothed to the Mountain King. Ørnulf Hodne (1999). Norsk folketro. Cappelen.